How would you rate the cleanliness of your commercial building? Many business owners do not understand the importance of keeping their commercial spaces clean. It has a major impact on your employees, as well as your business’s image. We have compiled a brief list of a few commercial cleaning tips that can help any business owner. Keep reading and discover a few commercial cleaning tips from the pros! One of the best ways to prevent the spread of germs throughout the office is to have hand sanitizer available for employees and clients. It is important to remember that germs quickly spread throughout a commercial facility in no time. It is amazing how quickly how electronics become dusty! When was the last time you did a thorough dusting of all of your electronic devices? This includes the tops of computers, monitors, speakers, and printers. More than likely, you probably have at least a few people in your office who have allergies who are affected by the presence of dust, so you want to rid your office of it regularly. One of the best ways to stop dirt and debris from entering your business is to have entrance mats at your doors. 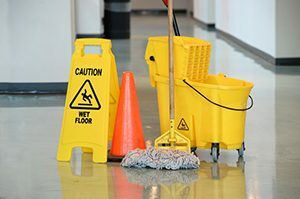 It is important to have a way for employees, customers, and visitors to wipe their feet when it’s wet outside. Entrance mats will also help to preserve the life of your carpets. In order to keep your commercial space clean, you need to give items in your office a home. In other words, there should not be cluttered dispersed across your commercial space. This will reflect poorly on your business and make it look like your employees do not care. By assigning places for pieces of equipment, supplies, etc., it will help your business to remain neat and tidy. Many cleaning products today feature a mixture of harsh chemicals. While it is okay to use them from time to time, you need to be careful. It is always a good idea to use gloves when working with chemicals. Also, be mindful of where you are using them. Places like inside or the refrigerator or microwave may not be suitable for certain types of cleaning products. This entry was posted on Friday, March 15th, 2019	at 9:17 am	and is filed under Commercial Cleaning	. You can follow any responses to this entry through the RSS 2.0	feed. Both comments and pings are currently closed.